The problem with diets is they don’t work – not in the long-term, anyway… This is why I created Lean in 15. In his first book, Joe Wicks, aka ‘The Body Coach’, reveals how to shift your body fat by eating more and exercising less. The record-breaking bestseller saw personal-trainer turned lifestyle coach Joe Wicks’ Lean in 15 method transform from Instagram success-story to a global sensation. Lean in 15 features a hundred recipes for nutritious, quick-to-prepare meals and guides you through Joe's signature HIIT (High Intensity Interval Training) home workouts - revealing how to combine food and exercise to ignite intense fat-burning. For someone who describes themselves as ‘just a personal trainer who loves to cook,’ in the space of a year Joe Wicks has risen from pretty modest Instagram origins to becoming Britain’s top health and fitness guru. Booksellers are a pretty sedentary bunch – more Proust than push-ups – but even some of our own have been seized by Joe’s charms, exchanging those lost hours in the local for hunting down quinoa and indulging in 20 minutes of advanced fat burning. 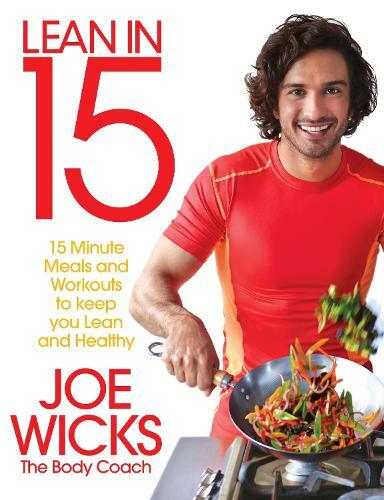 Core to Joe Wicks’ success is his ‘Lean in 15’ healthy eating program which has so far seen two phenomenally successful releases – the original Lean in 15, the book which rocketed straight to the top of our charts at the end of last year, Lean in 15: the Shape Plan, its summer follow-up that proved the first was no flash in the pan and the ultimate in maintained health Lean in 15 - The Sustain Plan. If getting and staying healthy whilst cooking-up delicious home-made muffins, burgers and burritos appeals to you – then ‘Lean in 15’ is for you. This book is awesome. When it says 15 minutes it actually means 15 minutes unlike some recipe books I've got. Great tips inside and already seeing the results. This man is a breath of fresh air.